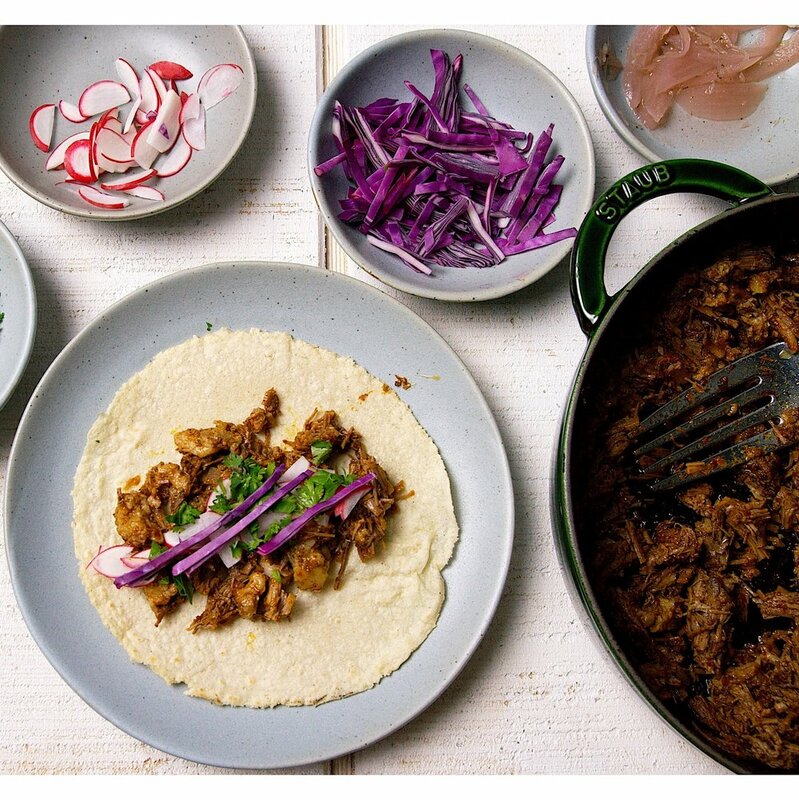 This is our version of an Oven Barbacoa Recipe - we still use banana leaves for the flavour they bring, and drench the whole thing in a super flavourful braising liquid that doubles as a salsa for serving. We may not be in Mexico… but we sure feel like it when we eat these. This recipe uses our Taco Spice Seasoning Blend Recipe. Rub the brisket with the seasoning mix, and place uncovered in the fridge overnight. Preheat the oven to 225ºF (100ºC). Remove the stems and seeds from the dried guajillo chilies, and toast in a hot dry cast iron pan. Place the onion, garlic, vinegar, lime juice, chicken stock, beer, salt, chilies, and tomatoes in a blender or food processor and puree. Line your roasting pan with the banana leaf, allowing it to hang over the side so you can wrap / cover the brisket. Put the brisket in the pan on top of the leaf, then pour most of the braising liquid over top (save some as a garnish for serving - it tastes like an amazing salsa). Wrap the top with the overhanging leaf, then cover the pan with a tight lid and put in the oven. Cook until the brisket is tender, and can be pulled apart with a fork, about 4 hours. Remove from the oven and allow to rest for 15 - 20 minutes. Discard the banana leaf and reduce braising sauce until thickened. Mix the reduced braising liquid back into the chopped up brisket.